Mr. Baumann first came to America in July, 1872, on the steamship "Rheim," and after landing in the new world remained in Philadelphia, Pennsylvania, for three and a half years where he worked in a blacksmith shop; he their returned to Germany, remaining four years, when he again came to America with the intention of making this his permanent home, which he has done. He sailed to America on the steamship "Ryland," coming by way of Bremen, Germany, to Baltimore, Maryland. Mr. Baumann was united in marriage February 25, 1885, to Miss Minnie Nenebroker, a native of Phalen province, North Germany. Mr. and Mrs. Baumann are highly respected and esteemed. Mr. Baumann came to Antelope county, Nebraska, in 1881, taking up the homestead where he now lives, which is located in section thirty-four, township twenty-five, range eight, and is still living in the first house built by him when he first came; he is one of the few old settlers of this region who are still living on the old homestead farm. The family experienced many hardships and discouraging incidents' which so many others did at that period, and they suffered losses through storms of almost every description, hail, wind, etc. ; in 1894, the drouth and hot winds which prevailed that year destroyed their entire crops; and many times they were compelled to fight prairie fires to save their home and possessions, and even their lives. Among the few old residents of Custer county who have retained possession of their original homesteads since first locating there is the enterprising farmer and stockman whose name heads this article. Mr. Emerson is a native of Alton, Illinois, born May 23, 1855, eldest child of Richard and Mary (Ellis) Emerson, who were parents of seven children. He has a brother and a sister in Minneapolis, Minnesota; a sister in Montana, a brother in Boston, the others of the children being deceased. Both parents were born in Massachusetts, the father of English parentage and the mother of English and Scotch descent. He died in Alton, August 5, 1872, and she in Minneapolis, August 23, 1910. The coat of arms formerly used by the Emerson family in England is in the possession of E. W. Emerson. Mr. Emerson was reared in Alton and there received the educational advantages afforded in the public school. As a young man he engaged in farming and in the spring of 1882 decided to seek the larger opportunities offered in the west and went to St. Paul, Nebraska, where he remained one year. Mr. Emerson was married at Hastings, March 7, 1883, to Miss Lou Edwards, who was born in London, England, and came to America in infancy. She had been a teacher in Illinois before coming to Nebraska. The young couple made their first home in Custer county, securing a homestead of one hundred and sixty acres of land on the northeast quarter of section twenty-seven, township eighteen, range eighteen, which has been their home throughout all the years since. Mr. Emerson has made all possible improvements and has brought his land to a state of large productiveness. He is one of the older settlers of his neighborhood and in early days met with many discouragements and trying experiences, but has met them with unflagging energy and ambition, never losing faith in the future of Nebraska. In his early years there he did freighting between Westerville and Grand Island, during this time enduring the hardships of Nebraska's severe winters. He is well known in, his part of Custer county as an upright and useful citizen and is regarded with respect and esteem by all. Mrs. Emerson died on the home farm in Custer county, March 17, 1894, being survived by her husband and five of her six children: Myra, wife of Henry Snyder, of Custer county, has two children; Ralph W., married and has one child, living in Lewellen, Nebraska; Roscoe, died in July, 1887; Daisy M. and Richard R., twins, the former deceased and the latter living at home; George E., in Massachusetts, and Mina Alice. Mrs. Emerson was deeply mourned by her family as a devoted wife and mother and her loss was a grief to her many friends. Mr. Emerson was married (second) at the home of the bride's parents, March 5, 1905, to Miss Melissa Irwin, who was born in Cass county, Iowa, and two children have blessed this union: Mary E. and Ada Mae, both at home. Ernest T. Irwin, a son of Mrs. Emerson, resides east of Comstock, is married and has one daughter. One of the well known and prosperous citizens of Valley county is the above named gentleman. He has resided in this county for many years, and until about two years ago, followed farming and stock raising extensively with pronounced success. He is now the owner of a valuable estate of about seven hundred acres, but has retired from active management of the property and lives in his own comfortable home in North Loup. Mr. Houtby first saw the light of day on a farm in Rock county, Wisconsin, the date being June 23, 1852. He was the third in a family of seven children born to Thomas and Martha (Dunn) Houtby. Only four of the children are now living, including our subscriber. Young, a native of Belmont county, Ohio. She is a daughter of George T. and Sarah (Moore) Young, natives of Pennsylvania and Ohio, respectively; they moved to Iowa in 1856 or 1.857, and here the venerable mother lives in Winterset at the advanced age of eighty years. In the fall of 1881, with his wife and two children, Mr. Houtby came to Valley county, Nebraska, and filed on a homestead of one hundred and sixty acres in section thirty, township seventeen, range fourteen, where they lived for about eight years. Then this farm was sold, and the southeast quarter of section twenty was purchased where they lived for about six years longer. Then section sixteen was purchased, a large eight-room sod house built, and this was the home place until 1909, when Mr. Houtby retired from active farming and moved to North Loup, after building a fine modern home on his property there. A view of the farm buildings in Echo Valley is to be found on another page. The dwelling is one of the largest sod houses ever built in this section or Nebraska. Mr. Houtby has always taken a deep interest in educational matters, and most of the time since he has been in Nebraska, he has served on the school board of his local district school. He has also served on the township board. Four children have been born to Mr. and Mrs. Houtby, all of whom are living: George T., the eldest is living in Valley county, on the home farm; Martha (Mrs. Billings Clark), now resides in North Loup; Myrtle (Mrs. Clarence Trump), also lives in North Loup; Edgar M., the youngest, also lives in this county near the old home place. Both Mr. and Mrs. Houtby have been active members of the Methodist church for many years, and the former has been superintendent of their Sunday school for twenty years. They are prominent socially, and enjoy the respect and esteem of a large circle of friends and acquaintances. Mr. Houtby is a firm believer in the principles of the prohibition party and trusts the day may come when those principles may prevail. He is a member of the Ancient Order of United Workmen. 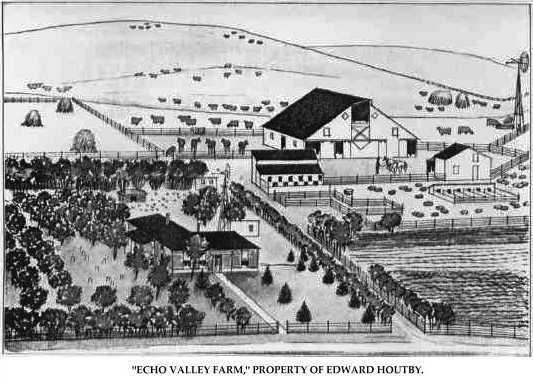 "Echo Valley Farm," Property of Edward Houtby. George F. Dewey, a successful and progressive farmer and stockman of Custer county, is a self-made man, and he and his wife have earned their present fine farm and comfortable home through untiring energy and thrift. He was born in Eldorado, Fayette comity, Iowa, January 1, 1868, third in order of birth of the eight children of Samuel and Amelia (Young) Dewey, who had three sons and five daughters. The father was a native of Indiana and the mother of England. He came to Iowa with his parents in 1855, was married there, and all the children were born in that state. In June, 1880, Samuel brought his wife and seven children to Nebraska, first settling in Wahoo, Saunders county. Later he purchased a farm on the line between Lancaster and Saunders counties. He died in a hospital in Omaha in September, 1905, having made his home with his sons in Custer county for five years prior to his death. The mother died in Wahoo in May, 1896. Seven children now survive: Mary, now Mrs. E. F. Peck, lives in Cedar Bluffs, Nebraska; James H., living north of Ansley in Custer county, married and came to the county in March, 1892; George F., whose name heads this article; Louise, employed by the government at Washington, District of Columbia; Laura E., now Mrs. J. H. Charling, of Saunders county; Myrta, a teacher in the public schools of Polk county, Nebraska; Helen, wife of Dr. Clarence LeMar, lives in Osceola, Nebraska. In June, 1880, George F. Dewey located in Saunders county, and lived on his father's farm on the line of Lancaster county until 1892, then came to Custer county and engaged in farming and stock raising. He was married January 1, 1897, to Bertha L. Bristol, daughter of Clarence R. and Nancy A. Bristol, a native of Iowa, their union taking place at Broken Bow. They have two children, Laura Emma and Frank R. Mr. and Mrs. Dewey live on the southeast quarter of section six, township fourteen, range eighteen, where they have a comfortable modern house, and a well equipped grain and stock farm. He made his first purchase on land in 1900 and now has six hundred and forty acres of choice farm land in his home farm, two hundred acres lying in section six and four hundred and forty in section five. He is a progressive farmer and is identified with the best interests of his community. The family are highly regarded and have many warm friends, having established themselves in the confidence and regard of their neighbors and associates. Mr. Dewey was renting four hundred and eighty acres of land in 1894, and owing to the drouth, raised nothing but an armful of roasting ears - a larger crop than most of his neighbors. During 1893 and other bad years he worked in eastern Nebraska, and in Rock county six months at one time. In 1899 hail destroyed his crops, leaving little worth gathering. Mr. Dewey came to Nebraska too late for big game, but Mrs. Dewey enjoyed venison while living in Cherry county. Until the spring of 1911 Mr. Dewey occupied a sod house, but at that time the family moved into one of the most pretentious country residences in the eastern part of Custer county. A view of the new residence with the old soddy included, is to be found elsewhere in this work. In politics Mr. Dewey is republican; he is a member of the Modern Woodmen of America and of the Royal Highlanders. 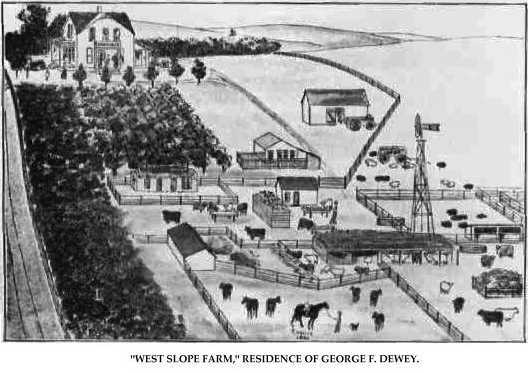 "West Slope Farm," Residence of George F. Dewey. Thomas Chilvers, engaged in the real estate, loan and insurance business at Pierce, Nebraska, is a man of extensive business enterprise, who has done his full part in the development of the natural resources of that portion of the state. Mr. Chilvers is a native of England, born in the town of Wisbech, Cambridgeshire, on March 10, 1860. He attended the Episcopalian schools there until nine months after attaining his majority, then embarked for the States, taking passage on the Cunarder "Servia," that being the ship's maiden trip. The voyage proved to be a stormy one - a gigantic wave demolished the hurricane deck, throwing the passengers in a panic, some thinking all would be lost, and for a time paudemonium reigned. After eleven days of buffeting, the storm subsided and they were safely landed in New York. Our subject came directly across the country to Pierce county, Nebraska, locating at Plainview on July 8, 1883. After a short stay there he came to Pierce and for five years filled the position of deputy county clerk, and later a similar position in the treasurer's office. He was then elected county clerk, serving one term; and at the close of same revisited his native land and spent about six months. On his return he opened his present office in the Pierce County Bank building and has succeeded in establishing a large and remunerative patronage. He is extensively interested in Nebraska lands. His own residence is one of the most beautiful places that could be imagined. He has a handsome dwelling, surrounded by beautifully growing trees and shrubs artistically arranged, all planted by his own hands, and his grounds, as well as those of the neighboring homes, are all covered by a lovely, velvety greensward which has spread from his own lawn. Mr. Chilvers was married in Pierce, November 25, 1885, to Miss Eliza Parker, a native of Nottingham, England. They have two children, Ethel, married Dr. Pheasant, who was one of Pierce's most promising physicians and who met with an accidental death in his automobile, October 4, 1910, and Ada, who married Albert Pohlman in 1909, he being a well known business man of Pierce. Mr. Chilvers is a republican, and has always been prominent in party politics. He is a member of the Masonic lodge at Pierce, also of the Knights of Pythias and Modern Woodmen of America, and is affiliated with the Norfolk lodge of Elks. The opportunities afforded honest industry to gain a footing in America were embraced by the gentleman whose name heads this article, and he is now recognized as one of the substantial farmers of Howard county. He came to this country from Denmark, and characteristic with his nationality, made the most of his opportunities, confident of success, and nothing in the way of discouragement or obstacles, that came in his way could daunt his spirit. Christen Sorensen was born on September 21, 1854, being the sixth in order of birth in a family of seven children born to Soren and Karn Erickson. Sketches of several of his brothers appear in this volume. His boyhood was spent in Denmark, and at the age of sixteen years he decided to come to America to seek his fortune, so together with his father and youngest sister, crossed the Atlantic, landing in New York in May of 1870. All the family, excepting the mother and one brother, who died in the old country, were already here, and had written them glowing accounts of the possibilities for succeeding in gaining a competency in this wonderful land. Some time was spent in Chicago, Illinois, also several years in Council Bluffs, Iowa, and Omaha, Nebraska, he finally landing in Howard county, where the balance of his family had located. Here he purchased a tract of eighty acres of land from the railroad, which he at once begun to develop, it being entirely barren prairie, and as the facilities for getting it in a state of cultivation were very few, he had uphill work during the first few years. On account of the unfavorable conditions which prevailed through the region at different seasons of the year, he had poor success some years, but gradually became better able to cope with difficulties which beset his labors and has accomplished his purpose o[f] accumulating a good property. He later sold forty acres of his first purchase, and when his father died he inherited the eighty acre homestead owned by his father. he now has one hundred and twenty acres. His farm lies on sections thirty-one and thirty-two, township fourteen, range eleven, and he engages in mixed farming and stock raising, having one of the best improved and equipped places in the section, supplied with good buildings of all kinds, etc. He has planted many trees, has a fine residence surrounded by nice lawns and shade trees, making it one of the show places in his locality. In July, 1880, Mr. Sorensen was married to Maren Jorgensen, the ceremony taking place at the home of Larke Sorensen in Nysted. They have had three children, two of whom died in infancy the remaining child, Ella Ida, wife of Mads C. Madsen, living on the homestead. They have three children, Hertha, Evald and Frode. The Sorensen brothers, Chris, Paul and Hans, are widely known as esteemed pioneers of Howard county, and in various ways all have contributed greatly to the success of their communities. They are all thrifty and honest, and deserve well the success and prosperity which has come to them. Larke, another brother, died in 1887.
house, by use of a wheel chair only. She has been a great sufferer. Mr. and Mrs. Sorensen are members of the Danish Lutheran church at Nysted. Edwin Stewart, son of William and Sarah (Gidney) Stewart, was born in the town of Conklin, New York, June 12, 1841; he was eighth in a family of nine children, and has one brother residing in Grand Island, Nebraska, and another in Boone, Nebraska, the others being dead. The father was of Scotch descent, born in New York, and died in Wheaton, Illinois, in the year 1895. He was a Wesleyan Methodist minister, and for other vocations was blacksmith, carpenter, cobbler and farmer. The mother was of English descent, born in Newburgh, New York, and died in 1873 at Gage's Lake, Illinois. In 1846 Mr. Stewart, subject of this sketch, went with his parents to Lake county, Illinois, where he received his education and grew to manhood on the farm. In October of 1861, he enlisted in Company K, First Wisconsin Cavalry, serving one and a half years; when through illness he was unfitted for service, and discharged at St. Louis, Missouri, in the fall of 1862. His brother, George W., served three years as orderly sergeant in the same company and regiment. After the war, Mr. Stewart returned to Illinois, farming until the fall of 1865, when be came to Nebraska, homesteading eighty acres in Platte county, near Columbus. At that time there were but eight miles of railroad in the state. For one year he worked with his team on the grade, and during 1867 was employed in Union Pacific bridge construction, helping to build the first bridge across the Loup river at Columbus. In the summer of 1869 he did government survey work along the Middle Loup river; during these early years Mr. Stewart had many counters with the Indians. In the fall of 1876, he returned to Lake county, Illinois, farming the old home place for ten years. Mr. Stewart was married on August 14, 1875, to Miss Annie M. Young, at Diamond Lake, Illinois. Miss Young was a native of Illinois, a daughter of James and Maria (Schadle) Young; the father was born in Scotland, and for twenty years sailed the high seas, and for one year on the great lakes. The mother of German descent, was a native of New York. Mr. and Mrs. Stewart have had three children born to them, namely: Laura E., wife of O. M. Frazer, a minister of the Quaker church, has three children, and lives at Econemy, Indiana; Millie A., who is the wife of C. V. Thomas, has three children, and resides in Greeley, county, Nebraska; both daughters Laura and Millie were teachers in schools of Nebraska and Iowa; Guy R., deceased in infancy; and two adopted daughters whose family name was Miller, namely, May B., and Agnes M., both living at home. In the fall of 1880, Mr. Stewart returned to Platte county, Nebraska, and in the spring of 1881 went to Greeley county, where he homesteaded an additional eighty acres, also timber-claimed eighty acres joining, near North Loup, living there until 1905; he then purchased six acres of fine land just outside of the city limits of North Loup, where he built a good home, which is his present residing place. Mr. Stewart served as director of his school district in Greeley county for several years, and for six years as justice of the peace; he was elected for a succeeding term but refused to qualify. Mr. Stewart is one of the earliest settlers in Nebraska, and is one of the best known citizens. His brother, Alza M. Stewart, took the first homestead claim ever issued in Valley county, Nebraska. Mr. Stewart is a prosperous and successful man of affairs, interested in all pertaining to the welfare of his state and county, and is widely and favorably known. Mr. Stewart comes from a family of patriots, from both the paternal and maternal side, and he, as before stated, and his three brothers served in the civil war. His grandfather, Jehiel Stewart, served all through the revolutionary war, and our subject now has in his possession the powder horn used by his grandfather, bearing the date March 28, 1775. He moved from Connecticut to Rockland county, New York, with an ox sled at a time When the only roads were blazed trails. Our subject's grandfather, on the maternal side, served in the war of 1812; amongst his ancestors were the Gidneys, noted for their physical prowess; one of them by sheer strength lifted a cart out of the mud. His wife's father, James Young, came to America from Scotland, his native land, in the fifties; he served in the civil war, enlisting in Company G, Ninety-sixth Illinois Infantry. This is a family history of which Mr. Stewart is justly proud, and he can relate many very interesting incidents of war. During his pioneer days, Mr. Stewart batched in a dugout with log sides, covered with a clay roof. He was a member of the party on the government survey in the valley of the Middle Loup, and endured many hardships and much suffering on the expedition. Once in the month of August the party was without water for an entire day. One man, exhausted, fell in the prairie, three miles from Camp; a flask of brandy kept life in him until relief reached them. Buffalo were plentiful during the sixties, while deer and antelope ran in vast herds over the open prairies. Few can realize that within the span of one life such transformations in the west could possibly be made. Mr. Stewart is independent in politics, and a member of the Grand Army of the Republic. George A. Schott, a prominent farmer and stockman living on section twenty-six, township twenty-three, range three, where he owns four hundred and eighty acres, is well known throughout Madison county, Nebraska, as a progressive and successful agriculturist, highly esteemed by all with whom he has had to do. Mr. Schott is a native of Germany, born May 7, 1854, in the province of Bavaria, and is a son of Leonard and Katie (Prohm) Schott; the father had a crockery manufactory in the old country. Our subject remained at home until he became a lad of about twenty-two years of age. In 1874 he left his native land for America, embarking at Bremen for New York on the steamship "Donner." After landing in the new world, he started for the west, locating in Boone county, Iowa, where he remained one year and worked at whatever his hands found to do. In 1874 he traveled farther west, settling in Madison county, Nebraska. and located on his present farm in section twenty-six, township twenty-three, range three, where he built a sod house in which he lived for several years. Upon locating on his land he at once went to work breaking up the prairie land and improving his farm, and was getting along fairly well until the grasshoppers took all the crops for three years in succession; it seemed that these pests would wait until nearly harvest time to work their devastation, as each year they would come in swarms and destroy growing crops when they were at their best, leaving nothing but stubble and bare ground in their wake, where before their advent had been abundant and promising crops. Deer and antelope were numerous in those first days on the western frontier, and were frequently seen in herds on the open prairie. On February 4, 1883, Mr. Schott was united in marriage to Miss Anna Eyl, a native of Indiana, and a daughter of August and Augusta Eyl. Mr. and Mrs. Schott were blessed with seven children, whose names are as follows: Carl, Otto, Martha, Pauline, Paul, Albert and Wilhelm, who died May 20, 1911. They are a fine family and enjoy the respect and esteem of a large circle of friends. Mr. Schott is a member of the Lutheran church, and is an independent voter. Steward B. Mathon was one of the early settlers of Custer county, Nebraska, being of the very first to locate on West Table, and has passed through the various phases of Nebraska's history since that time, being widely known in his part of the state. He was born in Pennsylvania, November 26, 1849, the third born of the eleven children of John and Rebecca (Corey) Mathon, both natives of Pennsylvania, and the father born in Washington county. The father was of Irish and the mother of German descent and both died in their native state. The only two of the children living in Nebraska are Milton, of Grand Island, and Steward B., of this article, but several of them still live in Pennsylvania. Mr. Mathon was reared on a farm in the state of his birth, receiving his education in local schools. In 1878 he went to Warren county, Indiana, and engaged in farming there, and on December 23, 1880, married Evangeline Shankland, of Indiana, a native of that state, daughter of Jesse and Elizabeth Shankland, the former of whom died in Indiana in the sixties, and the latter in Custer county, Nebraska, in May, 1907. Mrs. Mathon has one brother, George W., in Eureka valley, and a sister in Missouri. For one year after marriage Mr. and Mrs. Mathon resided in Warren county, and in March, 1882, came to Hamilton county, Nebraska, where for four years they engaged in farming. In 1887 they located in Custer county, taking a homestead of one hundred and sixty acres on section thirty, township eighteen, range twenty-three, which is now the home place. He pre-empted one hundred and sixty acres of land, and has made various improvements in his land, so that he now has a well developed stock and grain farm and is a prosperous and successful farmer. He has a good home and other suitable buildings on his place and has always shown a keen interest in the conditions and changes going on around him, giving his time and influence in furthering the development and upbuilding of his county and state. He is well known on West Table, where he has passed through the various stages of Nebraska history from the time of the pioneers. He was obliged to undergo hardships and tribulations before he could bring his farm under cultivation and realize a fair remuneration for his work, but has persevered in his efforts to bring his estate into creditable shape. Six children were born to Mr. and Mrs. Mathon, of whom only two now survive: Rebecca E., wife of Delbert Lewis, of West Table, has one child, and John J., who lives at home. During most of his residence in Custer county, Mr. Mathon has served as treasurer of school district number one hundred and ninety-five, and he has always been much interested in educational matters. A. E. Lewis, one of the oldest settlers in Pierce county, Nebraska, where he has resided all but one year of his lifetime, is one of the best known residents in this region. He came with his parents in 1869, and has lived here ever since. coming there built a sod house, in which they lived five years, and then put up a frame house. Here they lived until 1869, when they moved to Pierce county, Nebraska, driving from Wright county to their homestead claim, having one horse team and a team of cows, the latter having to work, as well as furnish milk for the family. The homestead is situated where Meadow Grove townsite is at the present time, it was a timber claim, and Columbus was the nearest market place, sixty miles distant. Indians were plentiful in those days; and a white man who owned a farm adjoining the farm of our subject's father stole a mule from an Indian and the Indians went on the war path, but did no damage. Mr. Lewis was united in matrimony in 1888 to Miss Mary Lyle, a native of Ireland, and they have one child, son Earl. Mr. Lewis homesteaded eighty acres of land in section four, township twenty-five, range four, on which he first built a sod house and later erected a frame house, and had five acres of trees on same; he has since bought one hundred and sixty acres in section eight, township twenty-five, range four, on which there is a fine grove of twenty acres of trees, he having two hundred and forty acres of land in all. Mr. Lewis has experienced all the hardships and privations incident to pioneer life, both on his father's homestead and on his own; he was through the grasshopper raids of 1873 and 1874 and also the blizzards of 1873 and 1888. He is a republican in politics, always voting that ticket. Richard L. Mills, whose name is familiar to all the residents of Merrick county, Nebraska. He is a worthy representative of the progressive farmers of eastern Nebraska. He was one of the very earliest settlers in this county, coming here in 1868, and has lived here on the original homestead continuously since that time. Mr. Mills was born in Devonshire, England, September 22, 1833, and was seventh of eight children in the family of John and Elizabeth (Locke) Mills, who had three sons and five daughters, and who were descendants of an old English family. Mr. Mills grew up on a farm and received a good common school education. April 7, 1861, Mr. Mills was married to Miss Elizabeth E. Knight in the city of Bristol, Somersetshire, England. Miss Knight was born in England, November 6, 1840. Mr. and Mrs. Mills left England in May, 1861, landing in New York City the latter part of that month, from which place they came by rail and steamboat to Florence, Nebraska. From there they went overland to Salt Lake City, Utah. Mr. Mills drove a team of eight oxen across the plains in Captain Creighton's train which was loaded with telegraph material, landing in Utah in September, 1861. They lived in Utah about six and a half years, and in July, 1868, Mr. Mills, wife and three children came overland to Nebraska from Utah with team and wagon, taking up a homestead on section six, township thirteen, range five, Merrick county, in the fall of 1868. Mr. Mills is one of the few original homesteaders of Merrick county that still reside on the old original land. In 1874 Mr. Mills lost the home buildings in the cyclone of that year. Mr. Mills now resides on the quarter of land taken as a timber claim, in the above named location and this property adjoins the original homestead. He has passed through many pioneer incidents, but most likely the cyclone is more vivid in his mind than anything else. Mr. and Mrs. Mills have had twelve children, nine of whom are living: Lily, wife of Mike McMahon, has nine children and lives west of Central City, Nebraska; Richard E., married, has seven children, and resides in Wyoming; Emma, wife of O. P. Taylor, has five children and lives in Columbus, Nebraska; William E., married, has four children and resides in Omaha; George, who is married and lives in Central City; Selina, wife of Harry Kidder, has four children and resides in South Omaha; Betty, who is married to Frank B. Daniels and resides in Lincoln, Nebraska; Susie, wife of Albert Baird, has three children and resides in Central City, Nebraska; and Annie, wife of David Baird, lives on the Baird farm north of Central City, and has two children. All the children were born in Merrick county, except the three eldest. Lucy, John and Frank all died in infancy, Frank being a twin of Selina. Mr. Mills and family are recognized as one of the old pioneer families of Merrick county. the children all being raised here. Mr. and Mrs. Mills have thirty-four grandchildren and seven great-grandchildren. They are widely known and have the respect and esteem of all who know them. Mr. Mills has from time to time filled all the local precinct offices and is a republican in politics. Mr. Mills was raised in the faith of the church of England and has always adhered to that faith. As an old settler of Knox county, Nebraska, and an agriculturalist of untiring energy and perseverance, the gentleman above mentioned needs no introduction to the people of his locality. Mr. Lantis has spent the past twenty years in this section of the country, where he built up a good farm and is highly esteemed by all as a worthy citizen. Mr. Lantis is a native of Missouri, his birth occurring in June, 1859, and he is the son of Martin and Elizabeth (Woods) Lantis, both natives of the Keystone state. When but a small child, our subject with his parents came to Iowa, where they remained for a number of years, and where our subject received his education, grew to his manhood days and later married. In 1891, Mr. Lantis with his family drove from Iowa to Nebraska, which state has been his home ever since. He has had his good and his bad experiences since residing here, but in checking up an average, Mr. Lantis considers his settlement in Nebraska state a lucky move. Mr. Lantis was united in holy matrimony in 1875 to Miss Annie Bradshaw, and Mr. and Mrs. Lantis are the parents of six children, whose names are as follows: Henry, James, William, Lottie, Blanche and Clyde. Mr. and Mrs. Lantis and family are well known throughout the locality in which they reside and hold the esteem and friendship of a wide circle of friends and acquaintances. Dennis Roberts, who lives in Platte Center, Nebraska, where he is known in an estimable way, occupies an enviable position among the old timers and successful ranchers of Platte county. Edmond Roberts, father of the above named gentleman, was born in Ireland about 1823, where in the year of 1862 he was married to Honorah Riordan and came to America in 1866, self, wife and three children, James, Dennis and Patrick, locating in Omaha, Nebraska, where they resided about three years and then came to Platte county, in 1869. Edmond, junior, was born in Omaha, so at the time the family came to Platte county there were Mr. and Mrs. Roberts and four sons. Mr. Roberts homesteaded in section eighteen, township eighteen, range one, west, and Platte Center now stands on part of the original. home farm. Mr. Roberts is one of the genuine old pioneer settlers and has resided on the home farm until this date, a fact which is rare in the progress and development of this portion of Nebraska. Mr. Roberts was always of quiet disposition and a man who has stood for the better educational and church lines, and is known and respected as a man of strict integrity and moral character. Mr. Roberts now in his advanced years is enjoying the fruits of a prosperous and successful life and has built up extensive property interests, Mr. Roberts and family having about seven hundred and fifty acres of choice Platte county land. Mrs. Roberts died in Platte Center at her home in July, 1909. Mr. and Mrs. Roberts remained on the home farm just outside the corporation limits of Platte Center at the time of Mrs. Roberts' death. She was survived by her husband and eight children, five sons and three daughters. Dennis Roberts, eldest of the living children, resides in Platte Center and is engaged in extensive stock interests, buying, shipping and feeding of live stock, and also has farm interests. He is well known in this portion of Nebraska. The other members of the family are as follows: P. H., who is married and living on his farm near Platte Center; Edward, who lives in New Mexico; Catherine, wife of I. J. Scanlon, lives in Omaha; Annie, residing at home; John, who lives in Omaha; Daniel, who is with his father on the home farm; and Sarah, wife of Thomas Corrigan, lives in South Dakota. The Roberts family are of the true pioneer stock, and have had a large measure of success due to their thrift and energy. Few men have the courage to face the problems of life after disaster, fewer still a second time, but such is the stamina of J. T. Woods, of Spencer, that after twice seeing a small fortune swept away, he braved the financial storm and beat out for himself a competency on which to retire in comfort while yet his mental and physical powers are unimpaired and while still able to shoulder the burden of life should necessity arise, and carry it to a successful termination.